Housing is a critical need for all individuals, and affordable housing is a good indicator of the job market and access to quality jobs within a community. Overcrowding, poor facilities, and homelessness exacerbate the experience of multidimensional poverty and increase risks for disease, depression, and transient housing experience. Ultimately, severe housing problems can lead to homelessness and increased housing vacancies, which are positively correlated with increased crime rates and result in an increased economic burden on a community. 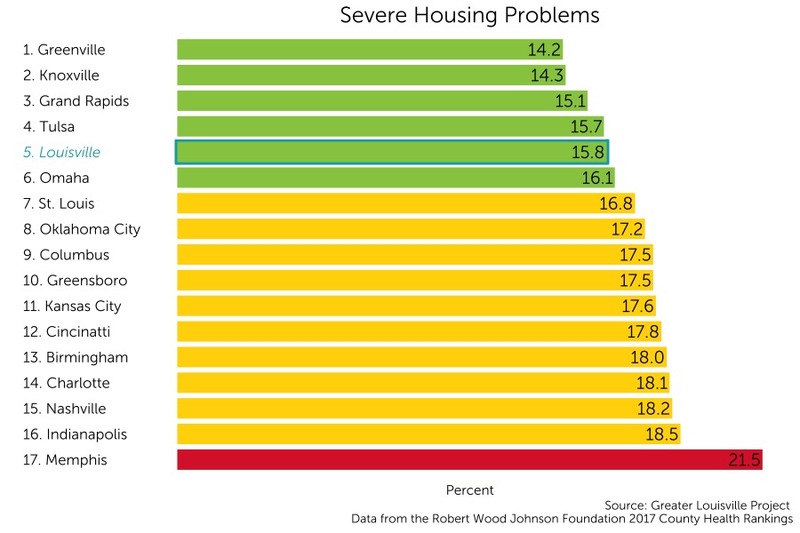 Louisville currently ranks 5th among its peer cities in percentage of people experiencing severe housing problems, which can include lack of kitchen facilities, lack of complete plumbing, overcrowding, or severe cost burden. There are 15.8% of Louisvillians that are experiencing a severe housing problem.